I can't test it myself as I don't have SED1520 display but if you test it please post your results here. Last edited by Henri on Wed Sep 22, 2004 11:28, edited 1 time in total. i was asked by Henri to give you some additional infos. Afaik all lcds using the sed1520 controller are graphical displays with a resolution of 122x32 pixels. They don't have a special textmode. The default settings of the driver are for the wiring below. Other wirings should be possible by changing the settings in the configuration dialog, but i couldn't test that. If you want to use an other wiring it is importent the the R/W pin is conected to ground, because the driver won't control this pin. Insteed it could control the backlight. Ehm , the backlight didn't work in the wiring below. Somebody told me i have to add a resistor between pin LED_C and the BS170. Shame on me, i didn't found the time to do that. Any other suggestions will be welcome. I have a differant type of SED1520 module, A Nan-Ya one. Which I have sort of got going, however it has a line down the centre of the screen 2 pixels wide, Everything else runs, however I just can't seem to get rid of this line. Any idea's? Did you have any similar problems when you did your display? do you mean, that you have two blank horizontal lines in the middle? Could you send a picture? I don't have anywhere to host a picture at the moment, PM me your email addy, and I'll email you one. Basically it's a single verticle line 2 pixels wide right down the centre of the screen. I think it's actually on the side of the first controller, as it looks very slightly off centre. I'm thinking at the moment that I might have damaged the controller, with some earlier experimenting, so I'll wire up a new display later today and test that theory first. OK... It's official, I didn't damage it, as a new one does exactly the same thing. I have a photo of what it does. It from x pixel 59 and 60, and repeats on every y co-ordinate, although the pixel at x=59 y=7 seems to ok, but occasionally isn't... Also the area at x=0 y=8 down to x=0 y=15 also seems corupted, as if it's getting data from end of the text line. Anyway... Not asking for an immediate fix, just asking if you had seen the problem before. Last edited by Syridian on Thu Jan 13, 2005 4:45, edited 1 time in total. Interesting link that other scheme, it has some extra glue logic to make it work, perhaps that's the solution to Syridian's SED1520 issues? Thats basically how I have mine connected anyway... Although for testing purposes I used an external ocsillator. JSC69 currently has one of my Nan-Ya displays and is having a look at it.... I hope. 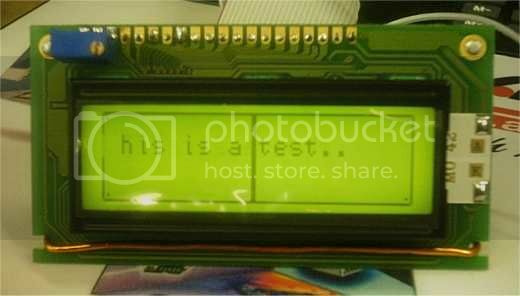 For you information: There are (at least) two different types of SED1520 displays. Some with a build-in clock signal (like mine) and some which needs an external clcok signal. LCDInfo only supports displays with build-in clock. So the problems I was seeing were cause by signals not sync-ing with my external clock? I thought it was strange that I got most of the display working but there was a little issue with only part of it. Are you trying to replicate the clock signal as an output on the LPT port through the driver? Thanks for looking at this BTW. I hope that display was enough to get you excited at looking at the issue. So the problems I was seeing were cause by signals not sync-ing with my external clock? No, that's not all The "behaviour" is also different. No. That wasn't my intention. First i want to make it run . To create the clock signal by driver sounds interesting, but i thing it difficult to realize. But i will kept it in mind.